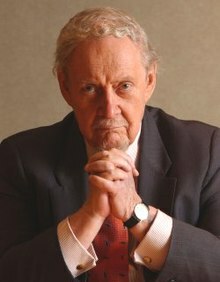 Robert Heron "Bob" Bork (March 1, 1927 – December 19, 2012) was an American writer, politician, lawyers, and legal scholar who was nominated by Ronald Reagan to be part of the Supreme Court in 1987, but his nomination was rejected by the Senate. He was the United States Solicitor General and acting United States Attorney General. Bork was born on March 1, 1927 in Pittsburgh, Pennsylvania. He studied at the University of Chicago. He was married to Claire Davidson from 1952 until her death in 1980. Then he was married to Mary Ellen Pohl from 1982 until his death in 2012. With Davidson he had three children. Bork died on December 19, 2012 from heart disease. ↑ "Judge Robert H. Bork, conservative icon, dies at 85". The Washington Post. December 19, 2012. ↑ Ethan Bronner (December 19, 2012). "Robert H. Bork, Conservative Jurist, Dies at 85". New York Times. Retrieved 2012-12-17. Robert H. Bork, a former solicitor general, federal judge and conservative legal theorist whose 1987 nomination to the United States Supreme Court was rejected by the Senate in a historic political battle whose impact is still being felt, died on Wednesday in Arlington, Va. He was 85. His death, of complications of heart disease, was confirmed by his son Robert H. Bork Jr. The Simple English Wiktionary has a definition for: bork.